May 24, 2017 — It’s been called the best example of funerary sculpture in America, although, admittedly, I might be quoting myself. 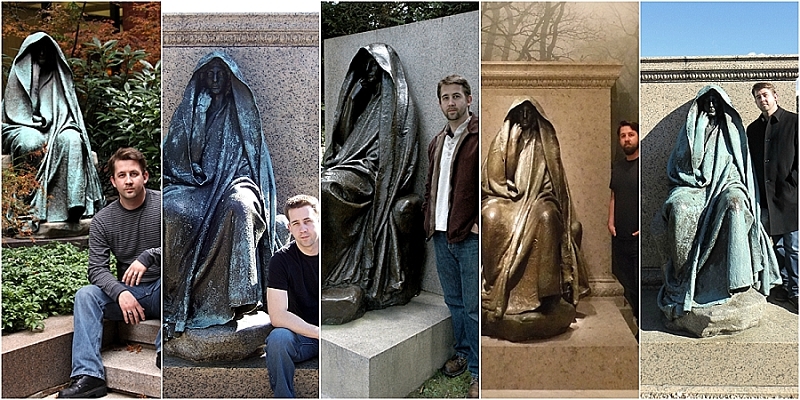 I’ve been obsessed with the Adams Memorial for a very long time. This story is one of suicide and art, theft and lore. It starts with a death, continues through a sculpture, and ends with a haunting. Tracking the physical elements of this story over the years has led me through two graveyards, a museum, a courthouse, and an artist’s studio. From mere steps away from the White House in Washington, D.C., to a mere mile away from the New Hampshire-Vermont line. Just by itself, the statue is fascinating: A dark, enigmatic bronze figure sits on a rock, its hand lightly touching its face and its eyes closed in eternal contemplation, the lines of its ungendered form softened and hidden by a full-length shroud. It’s as mysterious as it is serene. As spooky as it is enthralling. 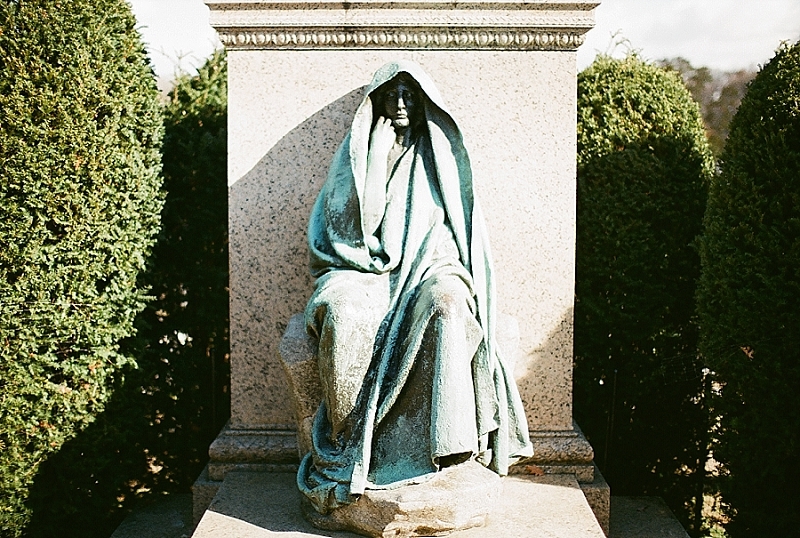 This is the Adams Memorial in Washington D.C.’s Rock Creek Park Cemetery. Henry Adams was a 19th century Pulitzer-Prize-winning historian and author, and part of the prominent Adams family that gave the country two of its presidents and plenty of other politicos, magnates, and over-achievers. But despite all his literary works, his most enduring contribution to humanity might be the single sculpture he commissioned. Because his wife committed suicide. Marian Hooper Adams, better known as Clover, was born to a wealthy Beacon Street family in Boston and married Henry at age 28. “Socialite” and “photographer” are the two words always used to describe Clover, with the latter taking on a particularly grim relevance to her death at age 42. In December of 1885, Henry found her on the bedroom rug in front of the fireplace. She had downed potassium cyanide, a chemical she used in the development of her photos. She left no suicide note as far as we know, but hypotheses for her demise fill out the usual spectrum for suicide. So, basically, no one knows why. Perhaps including Henry Adams himself. Author Henry James, a friend of Clover’s, probably put it best in a letter to another friend when he wrote that Clover had found “the solution of the knottiness of existence." There’s a lot of mystery about the Adams relationship, mostly because of how Henry reacted to her death. He burned their correspondence and some of his diaries from the period. It’s assumed that if she wrote a suicide note, it was torched, as well. Clover wasn’t mentioned in his autobiography (which posthumously won him the Pulitzer). In fact, the book skipped the whole two-decade period of his marriage to her. But the one thing we can be sure of is that out of that tragedy came a nameless statue. 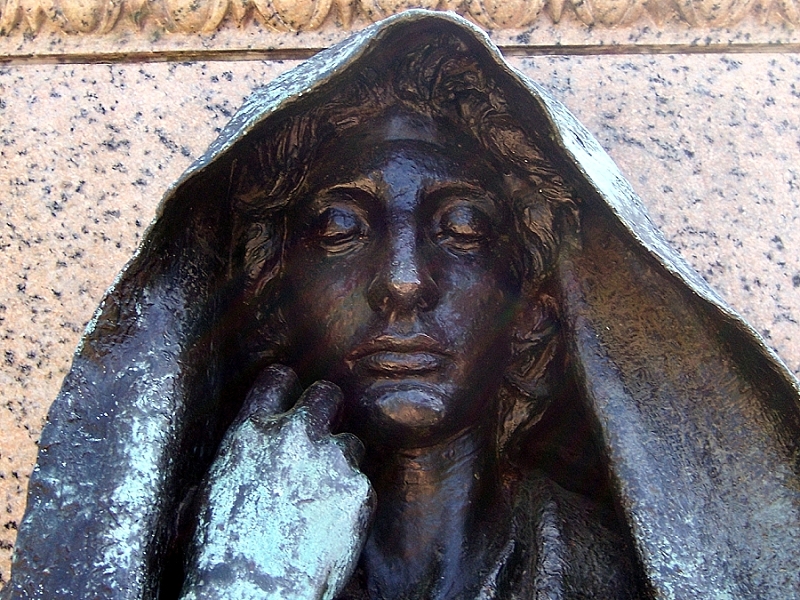 To memorialize his wife and eventually himself, Adams commission a statue by renowned sculptor Augustus Saint-Gaudens. The Dublin-born artist was a major, high-profile talent, and his work can be seen on everything from coins to monuments across the country. 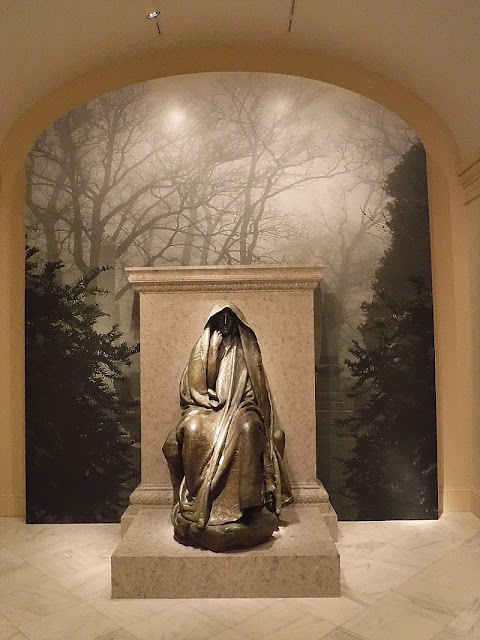 Adams tasked Saint-Gaudens to create something inscrutable, something passive, something distant form the cloying hopefulness of most funerary art. 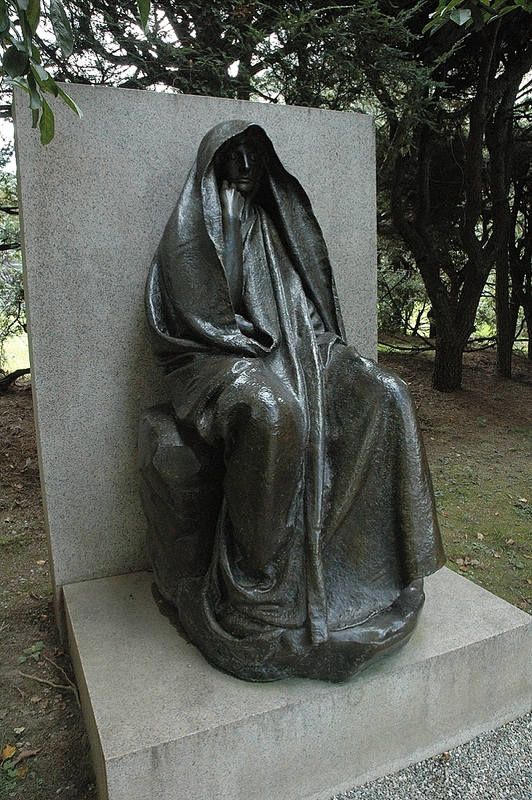 He didn’t even want it to have the context of a name, although Peace of God and Mystery of the Hereafter were bandied about on occasion by Adams and Saint-Gaudens, respectively. But once it was erected over the remains of his wife, the throngs of people who immediately turned it into a tourist attraction named it Grief. The first time I visited the sculpture, more than a decade ago. I’ve been to the Adams Memorial multiple times in my life over the course of enough years that my photos show it at various levels of mint-green oxidization and me at various levels of decay. 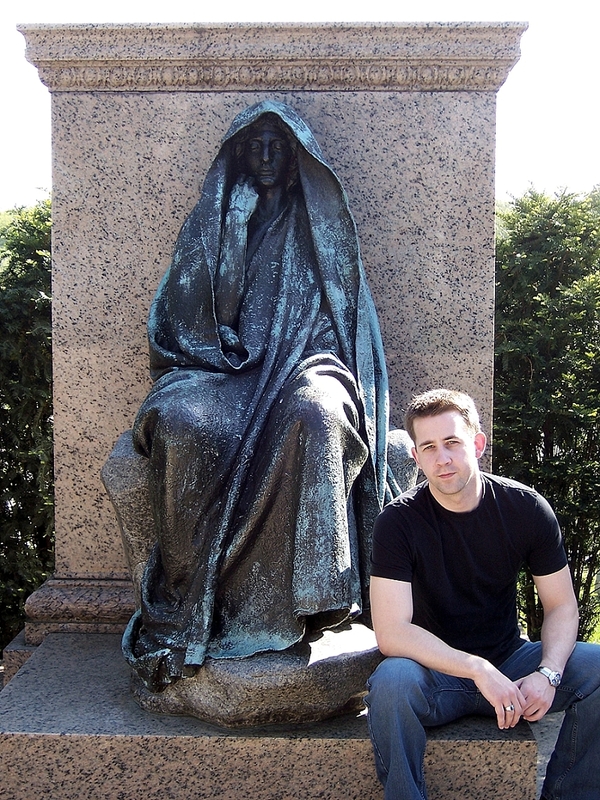 Rock Creek Cemetery is full of amazing sculpture, and worth visiting even without the enigmatic figure. In fact, not only has the artwork been purposefully shielded from any predetermined meaning, it’s also been purposefully shielded from the context of the cemetery. Its surrounded by tall bushes that encase it inside its own private space. The statue is backdropped by a door-size slab of plain stone, and directly across from it is a long curving bench bookended by eagle talons. The plot was designed by Stanford White, the architect of the second Madison Square Garden (who was murdered in his own creation by a jealous husband during a play…but that’s a different story). Most telling, no names adorn the memorial. Not Clover’s. Not Henry’s. Not even their auspicious surname. Two interlocking wreaths carved into the back of the pedestal are all that tells the tale of the Adams on their final resting place. Graveyards and cemeteries are custom-made for reflection, but never in my hundreds of visits to them all over the world, have I ever felt so compelled to sit and reflect than within the almost holy of holies of the Adams Memorial plot. To lower yourself onto that bench and try to match the statue thought for thought. It’s a sculpture without baggage in a pocket of silence, something that exists independent of everything around it. This statue could be guarding treasure in a ruined temple or buried on the moon waiting for us to start digging, at the top of a dome in a far-off country, on the chess board in a pantheon of bored gods, or in a haunted mansion hiding a secret entrance. Looking at it, you wonder at the very least if this figure should be secularly sanctified in a museum instead of out here against the fickle seasons of the Mid-Atlantic region. Turns out, it is. A casting of it resides in the Smithsonian American Art Museum. But even at that august D.C. institution, they’ve separated the sculpture from the other artworks, installed it by itself at the end of a hall, backdropped by a wall painted to look like a graveyard. Because it really, truly belongs in a graveyard. 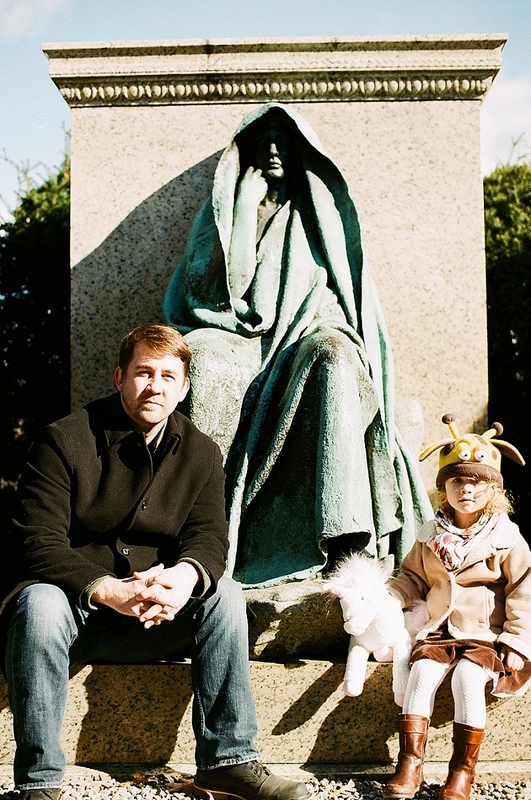 Or maybe even two graveyards…but we’ll get to that story during Part II of this article. Where we need to go now is about 500 miles north, to Cornish, New Hampshire. And then I saw it in New Hampshire. 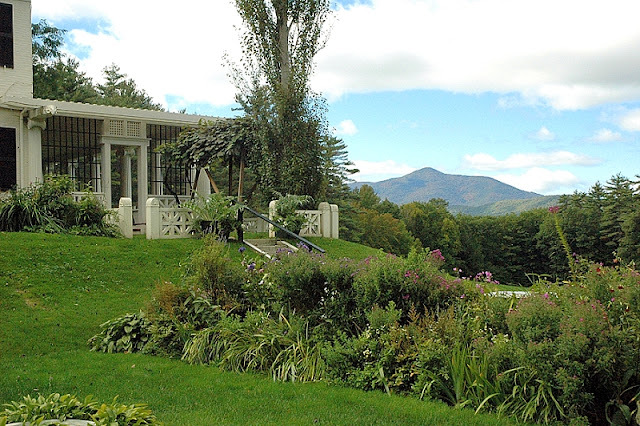 See, Saint-Gaudens had an out-of-the-way estate in the small town of Cornish, about 50 miles northwest of the state capitol of Concord and right on the Vermont border. The same town J. D. Salinger hid in to get away from all the phonies. Saint-Gaudens set it up as an art colony of sorts, with a home and a studio and landscaped grounds. He stayed there during the summers and eventually moved there from 1900 to his death in 1907. These days, his homestead is a national historic site. And it’s a beauty of a place, with views of the mountains, lattices covered in grape vines, flower gardens. 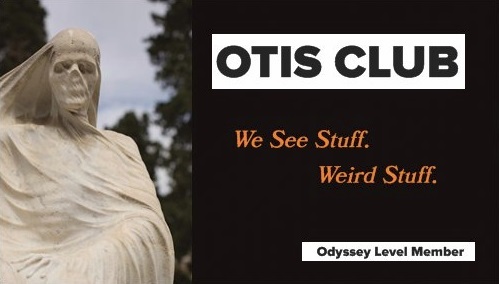 You can tour his home, see his studio, or wander the grounds marveling at castings of his statues. There it was, that sculpture so familiar to me, like an old friend, this time sitting and pondering among the colors of an early New England fall, its copses shot through with the bone white of birch trees. 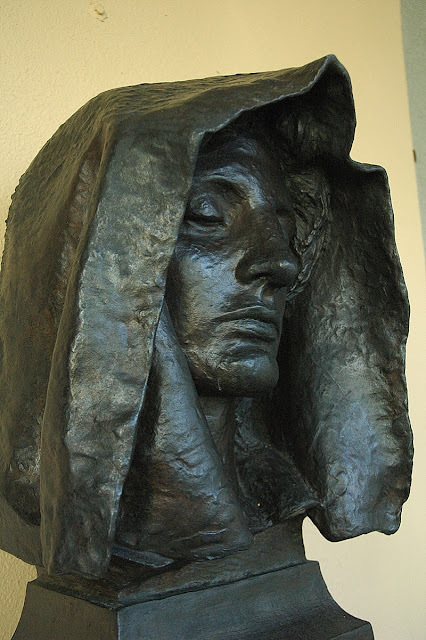 Elsewhere on the grounds a cast of just the hooded head sat on a shelf, as if awaiting its body in calm repose. The statue itself might have been surrounded by completely different flora than it was in Rock Creek Cemetery, but it was still inscrutable. Still mysterious. Almost like it had known I was coming and moved ahead of me. Like it was now haunting me in a physical way along with the mental way it has haunted me over the years. The Adams Memorial does have an actual haunt story, by the way, one that involves glowing eyes and copyright violation. A druid’s ridge and a deadly curse. The White House. But you’ll have to keep going for that story. The last time I visited the original sculpture, three years ago.